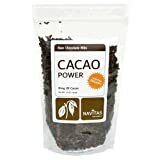 Summary: This is a recipe for raw mole sauce which I created when one day I was wondering what I might do with my new bag of raw cacao nibs (ohmygosh, they are divine), and I suddenly had a hankering for mole! This is a recipe for raw mole sauce which I created when one day I was wondering what I might do with my new bag of raw cacao nibs (ohmygosh, they are divine), and I suddenly had a hankering for mole! Place the above in a strong blender or a food processor and blend together until relatively smooth. Blend well. Use immediately or store in fridge and let the flavours blend together a bit. We serve it over mushrooms (mushroom mole), although there may be something over which it would be even better!